I know, I know. This one’s obvious. But you can’t have a section entitled “GM Bad Idea” and not mention the Chevrolet SSR. Not that they would’ve in the SSR. To accommodate the flared wheel arches, the bed was incredibly narrow, meaning nothing of actual substance could fit inside of it. Worse, all SSR beds had covers, which fit snugly over the top, making trunk space roughly equal to a midsize sedan. OK, fine, a large sedan. But not a Chevy Caprice Wagon. When the SSR came out in 2003, it had a 300-horsepower V8 and a 4-speed automatic borrowed from various other SUVs. To piss off early buyers, Chevy added a stick shift and a 6.0-liter V8 that made 390 horsepower in 2005. 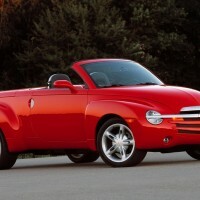 Interestingly, the SSR’s “muscle truck” image still didn’t manage to inspire any actual sales, and the thing was cancelled after the 2006 model year. And what was originally billed as the “world’s first convertible sport pickup truck” will no doubt fade into oblivion as the world’s only convertible sport pickup truck. As bad an idea as this truly was, I really do like them. The real problems with the SSR were: 1) the fender flares are cool, but the front end treatment is UGLY (yes in capitals) and 2) it was stupid expensive. But that is OK because Dodge (sorry Plymouth) made almost the same set of mistakes when birthing the Prowler. Then in effort to one-up Chevy they gave it a V6 + auto only combination, thus making it even worst. The problem is both vehicles look like kit cars you could build yourself. It’s too heavy. Approx. 4750 lbs. That pick-up/SUV frame really weighs it down. GVW 6050 lbs. so, will carry 1300 lbs. Heavier than a Dodge Ram extended cab p/u. This is a fine midlife (or later)crisis vehicle for a guy who wants a cramped convertible with a trunk big enough for two bags of clubs. Plus V8 sound. The loss the SSR was the gain for the Trailblazer. If they never had to fit the “real deal” LS2 into the SSR the Trailblazer SS would have probably ended up being a suspension and sticker special with a Vortec 5.3, or LQ4. With an annual build rate of a maximum of 13,000 units, about enough for every Chevy dealer at the time to have one on the showroom floor, a demo for test drives and one for sale, the SSR was not meant to generate sales but rather showroom traffic. It was intended as a halo vehicle. According to a market research study paid for by ASC, which was a primary vendor on the SSR, Chevy was selling an extra 70,000 fullsize pickups and SUVs a year to people who stopped by to look at the SSR. The profit on 70,000 fullsize BOF vehicles is a lot of money. So in the sense of a halo vehicle, the SSR actually worked, even if most car enthusiasts think of it as a failure because it didn’t sell in large numbers. The last saw one I saw used to be a guy that owned one on my block. He apparently was proud and always kept it very clean. I highly doubt he ever used it to haul anything. 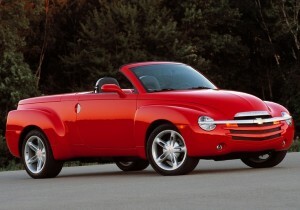 There was always the Shelby Dakota Convertible … good luck finding one, though. I wonder if the Syclone / Typhoon qualifies as a Bad Idea. GM product planners were in a haze in the ’80s, 90′s and even into 2000′s. 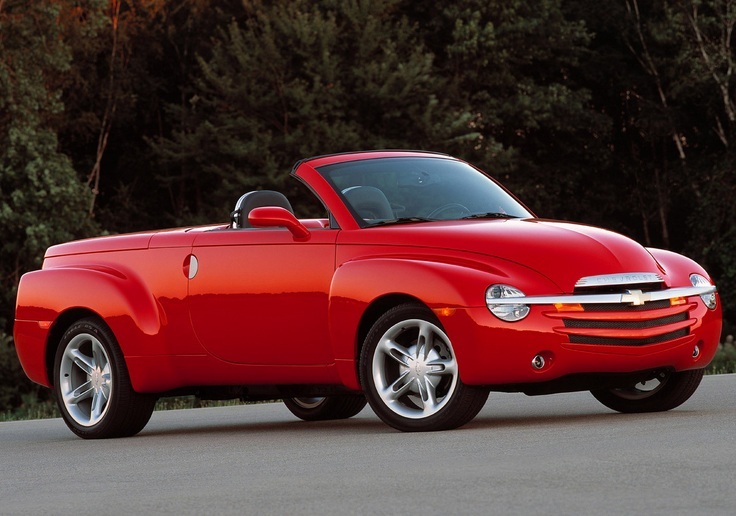 The Chevrolet SSR was one of GM’s more egregious creations. Kill off the Camaro and replace it with a cockeyed, retro themed, pseudo truck, overweight, playskoll quality interior and a body design so ugly it’ll make a blind man cut his wrists. Good going GM! Dealers couldn’t sell the damn things for a “mere” 40+K! SSR’s sat on dealers’ lots a lonnnnng time. Only old men (gear heads, the old Harley dudes and ghetto thugs can love those pathetic SSR’s. If you find beauty in the Pontiac Aztec then you’ll go ga ga over the SSR. A tea spoon of raw sewage in a barrel of wine is raw sewage. A tea spoon of wine in a barrel of raw sewage is raw sewage. Silly little person don’t hate the PLAYERS …… hate the Game !!!!!!! Sounds like you have a problem with people buying what they like . GET A LIFE….. if you dont like the truck thats fine, but dont place judgement people that can afford to have certin BIG BOY TOYS in thier lifes. you are all idiots! its a toy! made for fun not hauling mulch. If you need to haul mulch with it you can’t afford it! jackass!